An inverted dead cat bounce is quite the opposite of the dead cat bounce. A quick look is if a trader owns a stock following a quick and large (5-20%) gain there is normally a gap up. If you sell on the next day after the gap up day, thus unlocking profits its because prices normally start falling before beginning a new move upward (Bulkowski, 2005). The inverted dead cat bounce will occur when a company discloses news that will send the stock soaring by 5% to 20% or perhaps even higher. This event isn’t caused by takeover news since that event pattern indicates a stock moving up and staying up. 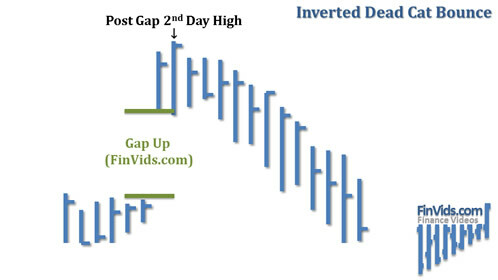 Instead, the inverted dead cat bounce is frequently earnings related or because of positive results from clinical drug trials, patent dispute resolutions, legal awards, contract wins, oil patch discoveries, etc..
After a price spikes upward, it will often drop back down inside a week or two. A frequency distribution of price momentum over time conveys that less than half the stocks will make a higher high the day after the announcement. But you are able to place a limit order to sell at the prior day’s high and see if it hits. You’ll want to day trade the exit, if possible, to maximize your profits.